The next review on Jeff’s Famous Jerky will focus on a 2.75 ounce/78 gram bag of their Smoked Paprika steak tapas style flavored beef jerky. As one of the newest flavors added by Jeff’s Famous Jerky, this seasonal flavor is described as being low in sodium using the best imported authentic Smoked Paprika from Spain to create a tender and mildly spicy deliciousness that you will absolutely LOVE. So get some now before it’s gone! Steak Tapas loosely translates to a Spanish savory meat dish. This bag was kindly submitted for review by co-owner Jeff Richards. It all started in the 70’s when Jeff Richards purchased a dehydrator from a county fair. Jeff’s mother, grandmother, and great-grandmother were all gourmet cooks. Many of the jerky recipes used today were refined for three decades. With more than 20 years of experience in the food industry, Jeff was ready to launch his jerky brand but wanted a reliable business partner. Through social media, Jeff reconnected with an old trusted friend Mike Aggarwal who himself had more than 25 years of experience in the food industry. In 2010, at the ages of 55 and 62, this Jeff’s Famous Jerky brand was launched with an old-fashioned handshake. Impressively, to date, over 1,000,000 bags of jerky have been sold. 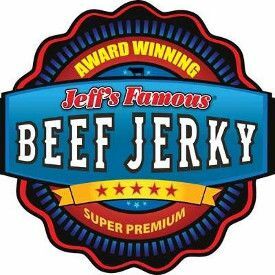 Jeff’s Famous Jerky brand is distributed under the name of Jeff’s Famous Foods, Inc., and they are located in Mission Veijo, California. The beef used here is guaranteed to be ethically raised 98% of the time, meaning free of growth hormones or additional antibiotics. There is not a 100% guarantee offered because sometimes the beef used cannot keep up with the demand. These cattle are not guaranteed to have at least partial free range access to roam about. As a result, the highest ingredient rating that can be awarded is a Very Good (9/10) rating. This liquid marinade here is comprised of a decent soy sauce, a fair Worcestershire sauce, super healthy balsamic vinegar, and healthy lime juice. It is disappointing to see that the Worcestershire sauce used the highly processed unhealthy sweetener high fructose corn syrup (HFCS) to lose a rating. 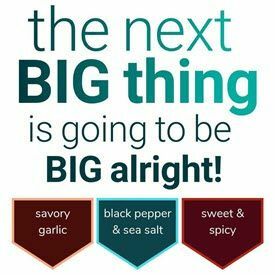 There are multiple healthy ingredients added such as fresh garlic, sweet smoked paprika, black pepper, cumin, and cayenne pepper. Not all smoked paprika is the same, which can vary in spiciness, and paprika is a type of pepper. Smoked paprika is smoked before it is crushed, and has a far stronger flavor than paprika itself. Commendably, the sugar level is only 1 gram of sugar per 28 grams of jerky. The salt level is extremely low at only 115mg of salt per 28 grams of jerky. 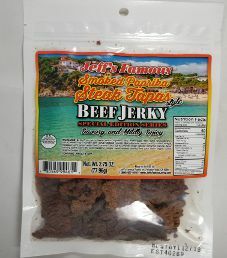 Jeff’s Famous Jerky Smoked Paprika Steak Tapas Style Beef Jerky explodes with flavor. The flavor profile is delicious and fairly complex. The Smoked Paprika is light while being complimented by other great flavors such as a light saltiness, some Worcestershire and Soy sauce, garlic and a little sweetness. There is a pleasant citrusy tanginess from the lime juice and the balsamic vinegar which brightens and rounds off all the flavors perfectly. These great flavors blend well together and they highlight the natural great flavor of beef while a subtle smokiness gently puts a cherry on top of this flavorful experience. The aroma is fragrant and inviting with the balsamic offering a longer lasting impression. These strips are mainly medium in size and are also sliced to a medium thickness. The texture is fairly soft and tender. The strips are cut against the grain and they are easy to chew. This flavor is advertised as mildly spicy and the spiciness barely registers on the first bite. After a few strips, a light and gentle spiciness begins to develop. Paprika is a ground spice made from larger and sweeter dried red fruits called bell pepper or sweet pepper. Their flavor differs significantly between each variety and ranges from mild to hot. We were informed that Jeff’s Famous Jerky only imports the best and most authentic Smoked Paprika directly from Spain. This Special Edition Jerky is only available for a limited time. 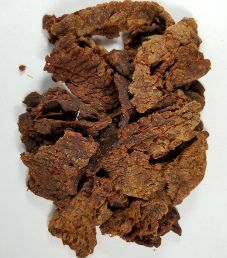 “Low Sodium Beef Jerky. We imported the best authentic Smoked Paprika from Spain to create our version of Smoked Paprika Steak Tapas. Tender and mildly spicy deliciousness you will absolutely LOVE”. Mark also added: “I did find this jerky to be addictive and perhaps one could argue that the smoked paprika could be at a higher level. Get it now, as this is a seasonal Special Edition Series”. I was a little more favorable towards Jeff’s Famous Jerky Smoked Paprika Steak Tapas Style Beef Jerky than Paul and Mark; I simply fell in love with the depth of flavors of this beautifully refined flavor profile. I ended up slightly tipping the scale and final rating to an Excellent (10/10) taste rating. Cheers! A 2.75 ounce/78 gram bag sells online for $7.49. That works out to $2.72 an ounce, which rates as an average price. Free shipping is offered on orders over $50. There are no slogans printed on this bag. Some facts printed on this bag are “Steak Tapas Style”, and “Special Edition Series”. The only bag category missing is a blurb printed about Jeff’s Famous Jerky, and this Smoked Paprika flavor. To the credit of Jeff’s Famous Jerky, there is a toll free phone number provided for customer inquiries. The bag listed at the bottom was part of an online purchase made back in 2010. The ingredient list has since been slightly tweaked, and the bag design has obviously been changed.